Located on the end of the ring road Plenty Gorge is easy to get to. There are a few places to park to gain access to the trails. Best trail access is located on the corner of Goldsworthy Lane at the large water tank, otherwise the car park in Yellow Gum Park provides good facilities such as toilets, BBQs and picnic shelters. Access from Plenty Road is limited and we recommend the extra 5 minutes to head to the other side of the park. 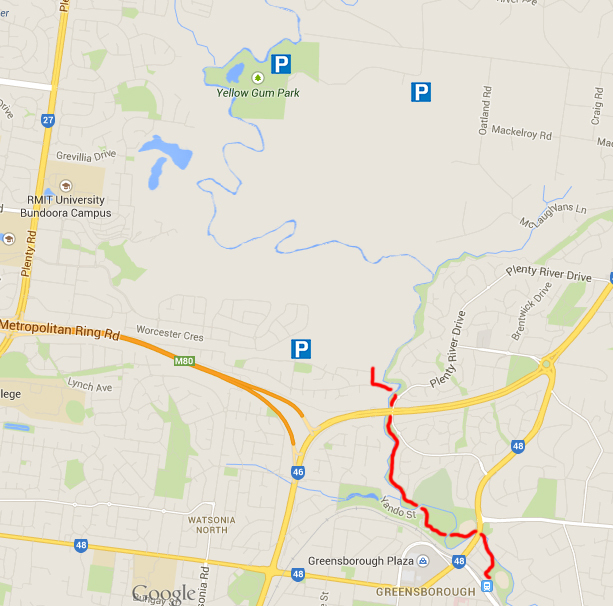 For public transport the club recommends access from Greensborough Train Station along the Plenty River Cycle Path, highlighted in red above. Just wondering whether its you guys or some locals who manage the enduro style trails on the Greensborough side of the gorge. I ride here all the time and would love to help them expand the network and maintain the jumps etc. As part of the process with Parks unfortunately no trails can be created or expanded upon. When the time comes though we will let you know!